Custom essay writing services came out of the shadow and took their rightful place in the lives of thousands of students. Needless to say that the discussions about the legitimacy and liability will exist till the end of the world, but we are not operating with the philosophy here, we thrive to describe the reality and guide you through the characteristics of the particular service, which is rather intensely praised in the students’ circles. As you can see, you choose the year of your education and give all the details regarding the order. 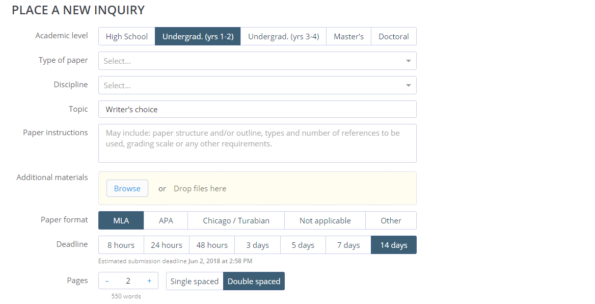 You also can state the number of sources needed if you have such a requirement from your professor and ask for PowerPoint slides if you have to present the essence of your paper later. Don’t worry, it looks like an extended form to fill but it takes minutes, and then, if you decide to place this order after you receive the confirmation and price details from the support team, you don’t have to fill out the similar form, this inquiry will be enough. 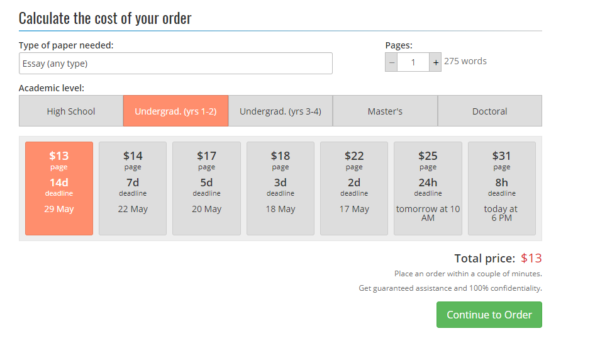 If you are ready to order, press on “Order Now” button at the top and you will see almost the same form as the previous one, just with several extra fields to fill. You will be asked to choose the writer’s category and offered additional services. Don’t get crazy here, and choose the minimum standard package if you need assistance with a simple paper. Of course, when it comes to the advanced papers, such as dissertations or capstone projects, you may consider paying more. SmartWritingService offers an impressive amount of guarantees to its clients, and you should know about them in advance to use this information in case something goes wrong. Of course, the writing company always claims that nothing can go wrong, but the reality is harsh to the unprepared ones. Money back guarantee. Based on this guarantee you can get a full or partial refund if the paper is poorly written, not based on your demands, if the deadline is severely violated, etc. Of course, you have to prove that this case is not a “revision case,” but from what we know, SmartWritingService acts rather reasonable in such negotiations. Free-revisions guarantee. If you are sure that the assigned writer at some point failed to follow the initial instructions you are free to file the claim for a free revision within 7 days after you receive the final draft. Don’t be shy to do it, as the support team is mostly on your side and the writers will try hard to meet your expectations. SmartWritingService doesn’t claim to be the cheapest academic writing service in the market, but in fact, the prices are very favorable. What is even more attractive is that the pricing policy is exceptionally transparent. Some agencies claim to have the lowest prices, but once you start the ordering process the extra features you didn’t ask for appear on your final bill. With this company, it is entirely reverse. They offer you to estimate the approximate price with the online calculator. If you don’t decide to add some extras (PowerPoint slides, samples of the writer’s work, etc. ), it will be the final price for your order. Convenient, isn’t it? As you can see, ordering in advance is exceptionally beneficial for your budget. This calculator is easy to use, and you can try different combinations to find the most suitable one for your current situation. Another guarantee that we haven’t mentioned before is the Originality guarantee, which states that each custom essay you receive from SmartWritingService is plagiarism-free, written from scratch and based on legit primary sources. To make sure these claims are for real you can use a free plagiarism checker provided by SmartWritingService. It is honed to detect even the slightest traces of plagiarism in the academic papers, but it can be used for other texts as well. 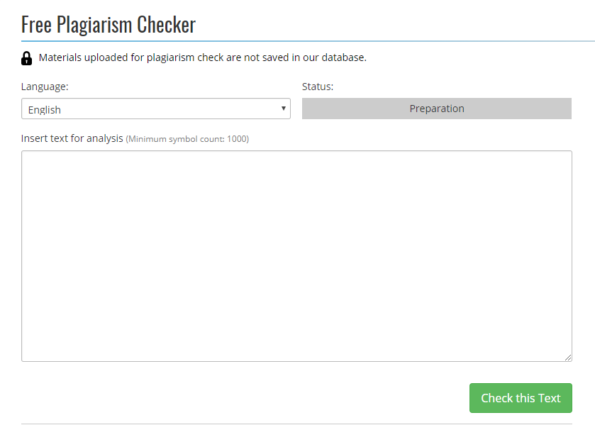 As any free plagiarism checker, even being a rather sophisticated one, this program detects only pieces plagiarised from the open web-sources. This essay writing service attracts customers with the fine balance of experience, which defines quality and safety, and innovations, which allow keeping considerably low prices. Through the years of work, this company developed a set of rules and an honor code, which ensure the guarantees provided to the clients. The prices are not the cheapest in the market, but they are close to that among the esteemed writing services you can truly rely on. The friendly and rather responsive support team can sweeten any deal, and you feel rather safe with the opportunity to check every final draft for plagiarism right on their website. If you are considering buying a custom written sample online, this writing service is a viable option for those who value quality and safety.